After exploring Southern Vietnam (Saigon) and Northern Vietnam, I decided to go to the town of Hoi An in Central Vietnam. 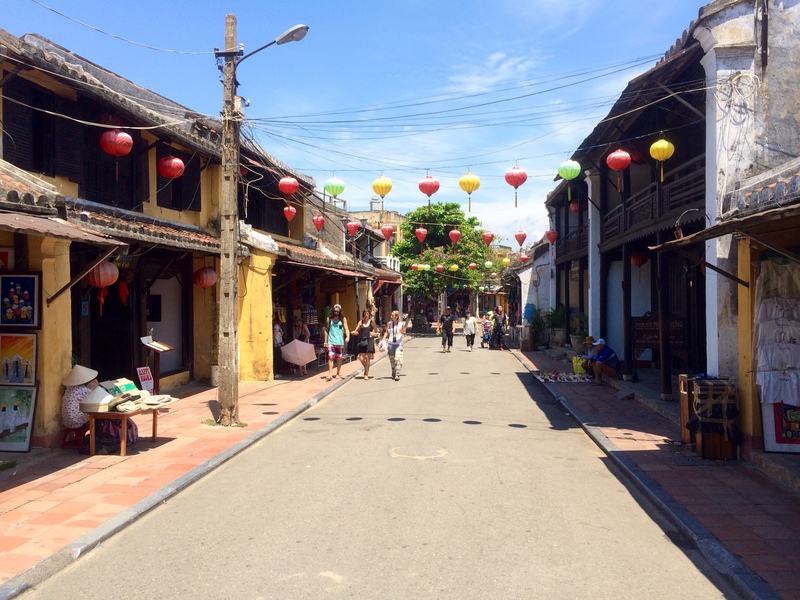 Hoi An is a small town with an unsual history. It used to be the largest port in Vietnam and has influences from Japanese, Dutch, and French sailors who have helped build the town for over 500 years. Eventually, the port was changed to nearby Da Nang (now the 3rd largest city in Vietnam). Hoi An is the only town in Vietnam to have all its colonial era buildings survive the “American War of Aggression”, which makes it a great travel destination. 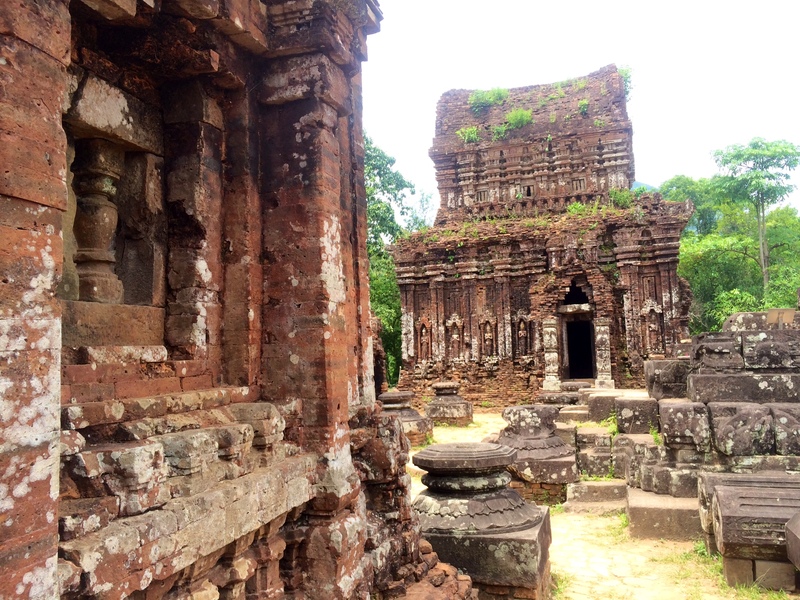 In 1999, Hoi An and the nearby My Son ruins became UNESCO World Heritage sites. This caused the town to rapidly change from a sleepy fishing village to the largest tourist destination in Vietnam. The city touts its World Heritage status and has erected numerous statues of the UNESCO logo all over town. All the water grates in town also bear the UNESCO logo. Now the town has a Disneyland-esque atmosphere and is basically a theme park for middle-aged tourists- an Asian version of Carcassonne, France. Every house/storefront/building in the town now caters to the tourists. 23 historic buildings have been preserved as museums, accessed by a ticket-coupon system. There are now at least 100 restaurants and hundreds of shops (mainly selling clothing) in a town of only 6,000 people. The restaurants here have touristy names such as the Banana Leaf Cafe, Blue Dragon, or Red Gecko (actually the Red Gecko serves the best Vietnamese food I’ve ever had). Additionally, to create a better tourist atmosphere, Hoi An has banned all motorbike traffic in the Old City, which is amazingly refreshing. Tourists are able to walk down the narrow streets without having to constantly fear being run over or honked at by motorbikes. Additionally, the town has installed loudspeakers at every street corner that play music that caters to middle-aged people (instrumental versions to Beatles songs, the Romeo and Juliet theme song, Edelweiss, etc). Coming from Hanoi, Hoi An is a very relaxing place to be, albeit strange. The one negative about being in such a touristy area in a poor country is that every person who isn’t a tourist (about half of everyone here) will try to sell you something. 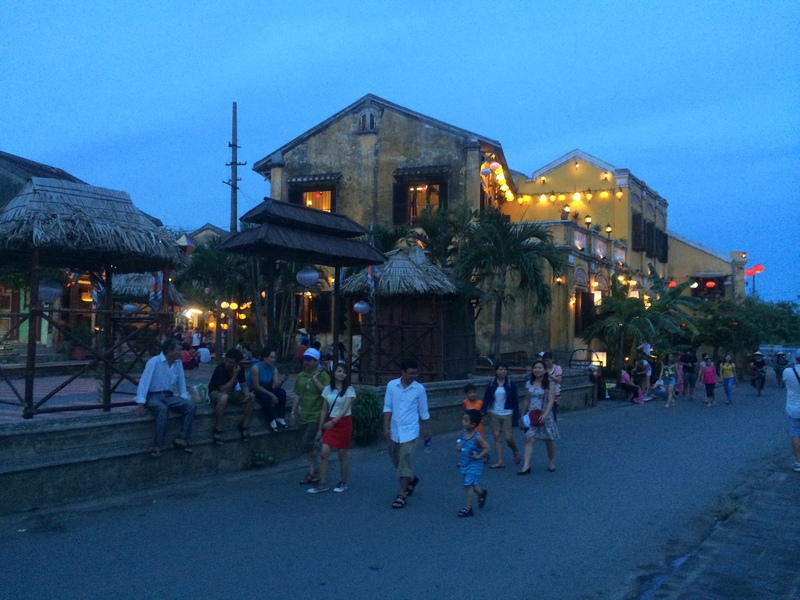 The best time to be in Hoi An is definitely at sunset and during the night. Since the weather in Vietnam is so hot, people generally don’t like to be outside during the day, so the streets seem oddly deserted. At night, the thousands of red Chinese lanterns turn on to create a beautiful atmosphere. 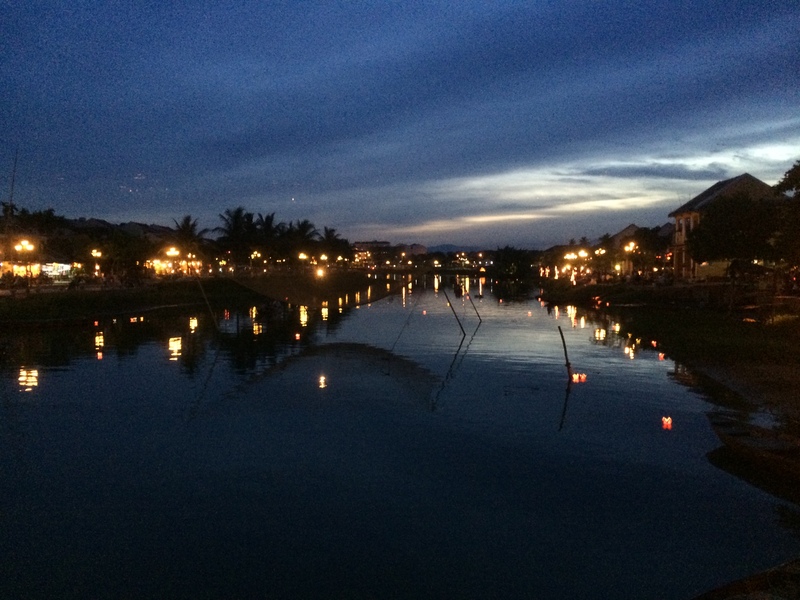 The river in Hoi An at dusk. While Hoi An can be “done” in about an hour, I decided change things up and spend 5 days here. The pace of the trip here slowed down considerably (which is why I am only writing 1 blog post about it). Instead of a normal hostel or budget hotel, I did a homestay, which is kind of like a bed and breakfast. My host family of 4 included the parents Rocky and Lin. They cooked me breakfast each day and gave me advice on how to spend the rest of the day. Staying here was very relaxing. Every night, I went to bed around 8:30 pm and sleeping for 12 hours. While there were bars selling the cheapest beer in the world- 10 cents a glass, Hoi An was not a nightlife destination, so I generally avoided going out here. While there wasn’t all that much to do in town as a single young man, there was actually quite a bit to see out of town. 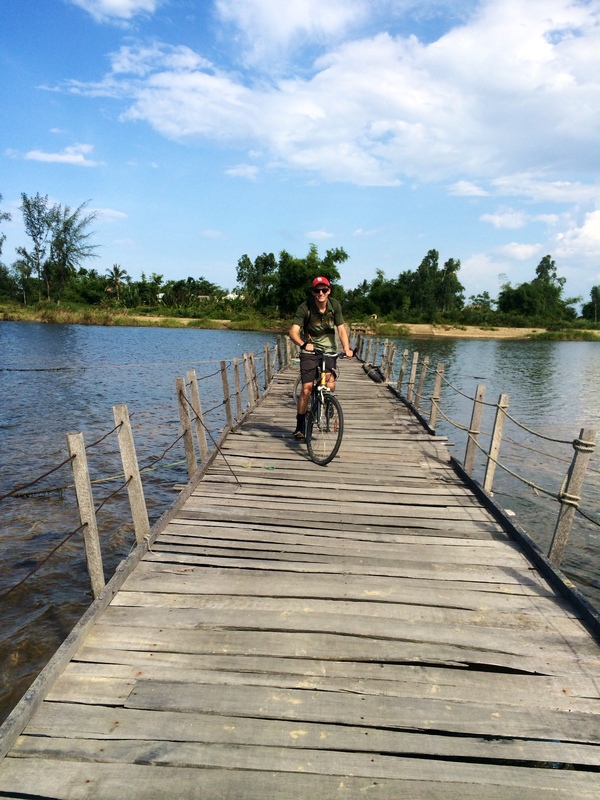 The first day, I took a bike tour to the surrounding villages and learned how to do various crafts. 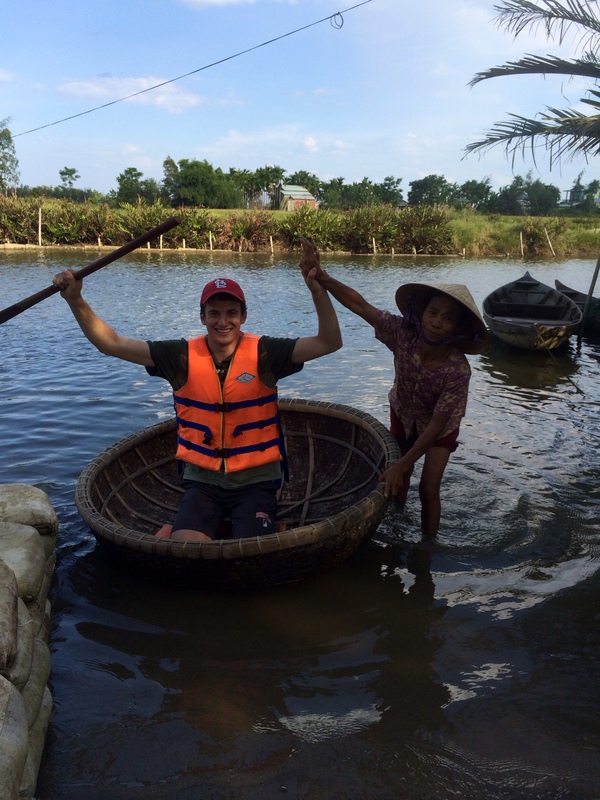 One of those crafts was learning how to paddle a Vietnamese roundboat. Everyone else in the group paddled accidentally themselves down the river, but I managed to paddle the boat across the river and back. The villagers were all impressed. The roundboat captain was impressed. 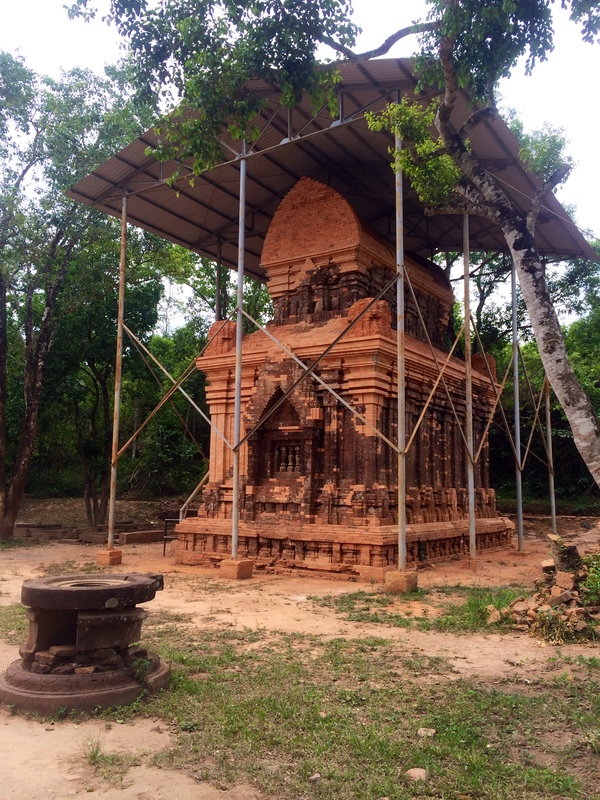 The next day, I visited to the 4th century Hindu ruins of My Son. While the local people compared the 12th century ruins to Angkor Wat in Cambodia, they not nearly as impressive- I doubt that any of the locals have actually been to Angkor Wat. That said, they were pretty cool. My Son ruins. Look on the Wikipedia page and you will find a very similar picture. My Son was mostly destroyed by American bombers in 1969. The government is trying to restore the ruins, but is doing a mediocre job. The most memorable part of the trip was the horrendous tour guide, who was overly dramatic, spoke terrible English, and repeated everything he said at least 3 times. While the guided tour of the ruins lasted only an hour, the whole ordeal took 5 hours. This was because the tour guide twice decided to stop at a souvenir store for 30 minutes so everyone on the tour could get coffee and buy trinkets for which he surely received some commission. He also tried to sell us drinks during the “super deluxe minivan” ride to/from the ruins. We also had an unexpected hour-long boat ride back to Hoi An at the end of the trip which included another 30 minute souvenir stop. Nobody on tour bought anything- partly because the shop sold low quality statues that nobody would ever buy and partly out of spite because the tour guide was so bad. 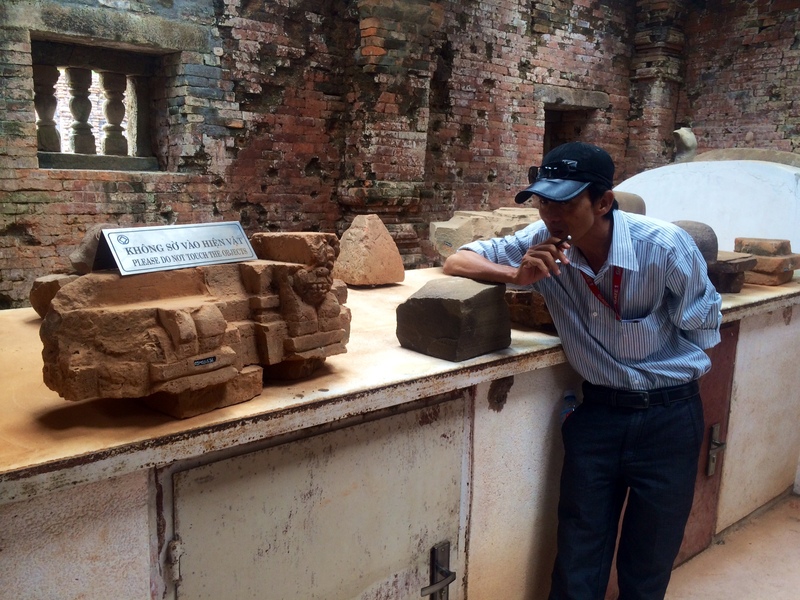 Our guide completely ignoring the “DO NOT TOUCH THE OBJECTS” sign he is staring right at. 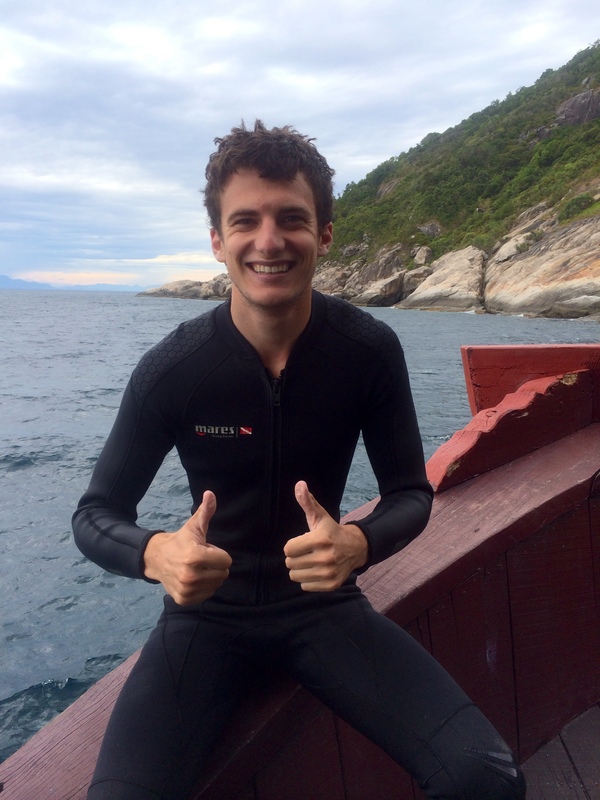 The third day, I went scuba diving in the nearby Cham Islands in the South China Sea. The trip was run completely by Europeans and Americans, because (something I did not know) the vast majority of Asians cannot swim. This seems really strange since Vietnam is basically a giant coastline. Its really a shame for the local people since the coral reef was absolutely stunning with lots of eels and blue coral. While on the first dive, we ran into some people collecting coral samples and catching fish in traps about 60 feet below the surface. After surfacing, my guide said that they were illegal sea poachers (the islands are a UNESCO Biosphere Reserve). The guide then told the captain of the boat who phoned it in to the police. The poachers were then arrested after coming ashore- we didn’t actually see the arrest happen, but were alerted by the captain later in the day. 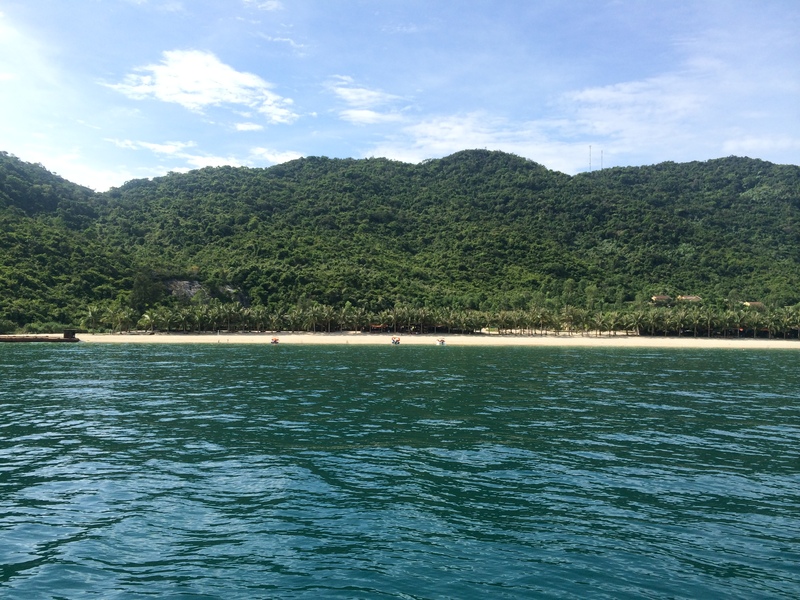 Cham Islands- got to hang out on that beach for the afternoon. On the last day in Hoi An, for the first time in who knows how long, I did absolutely nothing memorable and just relaxed. That final night was the full moon festival. Unlike a certain Thai island which has the crazy full-moon party, the full moon festival here is a time to pray, contemplate, and spend time with family. All the lights in the town are turned off and everyone guides themselves around using only the moonlight. The music is turned off and all the shops are closed. 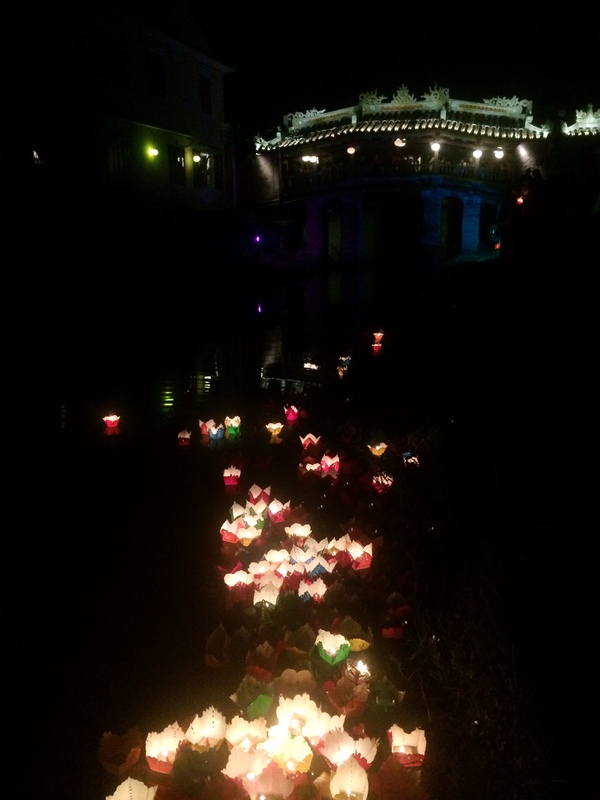 Along the river that runs through the middle of town, people buy candles, place them in paper lanterns, and float them on the water just like in movie Tangled. It was cool to see such a touristy city suddenly become not touristy. Truly the perfect end to my stay here. 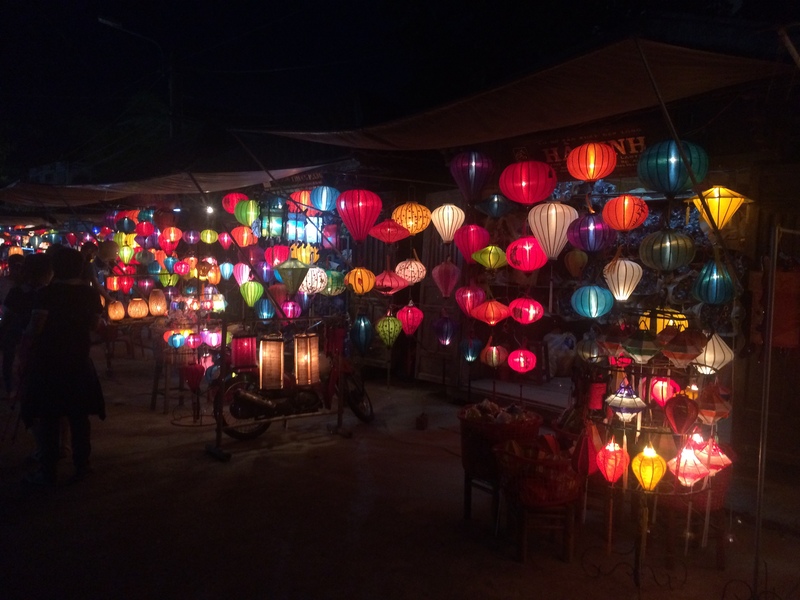 While I did not enjoy my first day in Hoi An, it really grew on me. I would certainly recommend a visit here, especially after going to one of the large cities in Vietnam.